Charton Hobbs Inc. and Veuve Clicquot is proud to announce yet another edition of the annual Yelloweek, showcasing the famous Veuve Clicquot Champagnes. 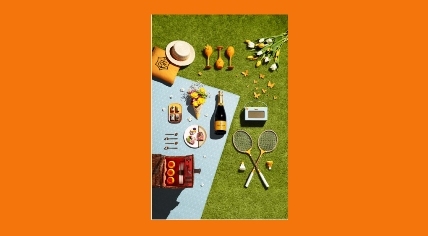 Edmonton is echoing the Toronto Pop Up, where each city will have a Veuve Clicquot pop up space during the week of June 18th to 24th. The Edmonton pop up will be at the Foundry Room – (10528 – 108 Street) downtown. The hilite this year will be a sit-down tasting – $50 at the Foundry Room on Friday, June 22nd at 6:30pm. Led by Veuve’s Regional Brand Manager – Jenna Usunier, this event will feature five Veuve Champagnes including a Rich Cocktail, the NV Brut, the NV Rose, the 2008 Vintage Rose and the brand new Extra Old Extra Brut. Advanced registration is required for this limited seating event, please book here... The event pdf can be seen here..
Also, our new deVine’s Veuve window display is done, come in to check it out! Have a great Yelloweek experience everyone! We went from winter to summer in one shot, thus bringing the rosé season into high gear pretty quickly here! Pinks are the rage, perfect for sipping on the deck, yet perfectly comfortable as a food and wine pairing. 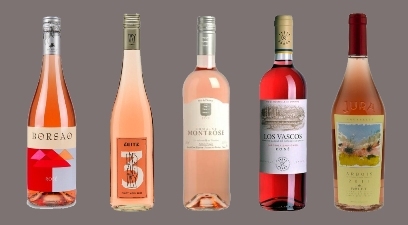 95% of rosé are dry and its quickly finding a niche with the North American public. We’ve got lots of pinks on hand to choose from so drop in. We have many other new rosés arriving so check out our dedicated rosé section the next time you’re in. Also, don’t forget to sign up for our stand-up Rosé tasting, entitled A Rosé by Any Other Name – $30 that is selling fast, you can register here..
Alley Kat’s latest Seasonal Collection is the Full Squeeze, brewed in support of Edmonton Pride Festival Society. 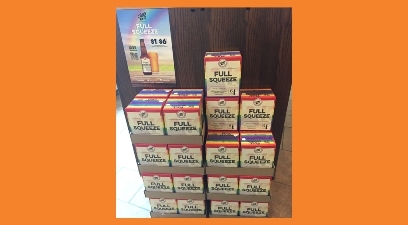 This unpasteurized release is in a six pack configuration – $18.49, with $1/bottle or $6/six pack which will be donated to the Pride Festival Society. What better way to celebrate togetherness than to blend two beloved Alley Kat brews – Full Moon Pale Ale and Main Squeeze Grapefruit Ale – unique by themselves, but together, the perfect marriage! This is in stock now, so grab yours while supply lasts. The City Market returns this Saturday, 9-3pm – yay! Be sure to drop by starting at 11am as we introduce the Traveler’s Series of free tastings, whereby one of the partners of deVines will be serving and talking about wines, beer or spirits from our extensive travels to wineries, breweries and distilleries. Sample the wine and hear the anecdotes and stories! Then stay for our ongoing Agent Free Pours from noon-3pm which includes wine and beer pours. The inaugural tasting wil be hosted by Ed Fong and we’ll take advantage of his recent trip to Germany to sample two Rieslings and a beer. Do join us this saturday! Sour beer is the rage these days – it is essentially beer which has an intentionally acidic, tart or sour taste – popular styles include American Wild Ale, Berliner Weisse, Gose, Flanders Red Ale, Lambic and Oud Bruin – there will even be a $50 one we’ll be tasting! The main flavor of a sour beer is tartness, like a strawberry or lemon. But many sours also have a “funky” taste that some say smells like a horse blanket or a barnyard but there is certainly some major pucker power here. Because of the uncertainty involved in using wild yeast, the sour beer brewing process is extremely unpredictable. The beer takes months to ferment and can take years to mature. 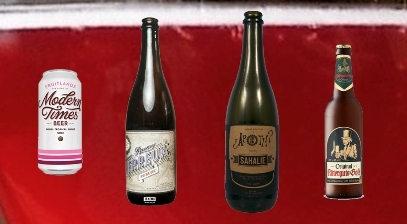 The increasing popularity of sour beers, combined with the fact that they’re challenging to make, available only in limited quantities, and expensive, makes them desirable. And as more beer lovers learn about them, they are sharing their knowledge with other drinkers, further triggering the trend. We are thrilled to have Jim Phelan of Untapped Craft Imports here to lead our Sour Power tasting – don’t miss this Thursday night stand-up event. It’s Mother’s Day week, thought I’d do a tribute to Women and Wine featuring prominent women winemakers and owners. The seven ladies featured here are leading performers in their regions so a big salute to them. Nathalie Bonhomme for whom this wine is named is a frequent visitor to Edmonton and has a close association with deVine’s. She is not only the owner and winemaker, but she also creates her own labels. Those of you who remember in 2013, we offered the Promenade Red, under our own label, well – Nathalie made that wine! Chateau de la Font fu Loup (translates to Fountain of the Wolf, when wolves drank from the natural springs around their property) owner Anne-Charlotte Melia-Bachas comes from a long line of talented winemakers, like her father Charles before her. Aiming to express the uniqueness of their terroir, the family has holdings in the famous Le Crau, not too far from Vieux Telegraphe. Their wines are organically farmed and very pure. Love their Chateauneuf du Pape as well. Noble Ridge owner Leslie d’Andrea has degrees in Biology and Health Administration and she and her husband Jim found their land in 2001. Since then 22 hectares have been planted to vines with all the grapes grown on their Okanagan Falls property. 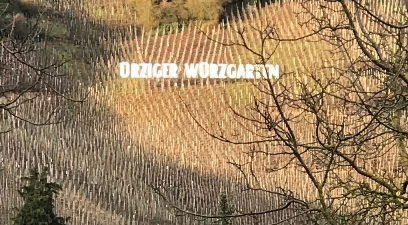 Having found her love and passion to make world-class premium wine and along with a lot of hard work, its starting to pay off with a budding reputation. The jouney continues..
Andrea Mullineux, named Winemaker of the Year 2016 by Wine Enthusiast, is co-owner and winemaker at Mullineux & Leeu Family Wines, based in the Swartland region at Roundstone Farm. 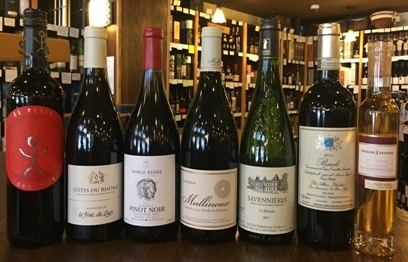 Since the launch of the brand in 2007, Mullineux, has notched up 18 five-star wine ratings from Platter’s South African Wine Guide as well as being named Winery of the Year in both 2014 and 2016. High praise indeed. The Comtesse Evelyne de Pontbriand runs this beautiful estate on the north bank of the Loire. There are not many wines from Savennieres that make it to our part of the world, and her Chenin Blancs are like her – aristocratic, high class and finesse driven. Certified biodynamic, we only wish we could get a dessert wine and an amazing Sparkler, but we’ll gladly settle to have three of her classy artisan whites. More and more these days, daughter Silvia Altare has taken helm as winemaker at the famed Elio Altare Estate while her father Elio ventures off to create a different vision in Liguria. Silvia was here at deVine’s a couple of years ago to promote her vision of elegance, finesse, and balance in her wines, following a strict regime in the vineyards to allow the terroir to come through, adopting new vinification and aging techniques in the cellar. There is a move to a younger generation of winemakers in the Piedmont and Silvia is at the forefront. Since 2012, Winemaker Katie Dickieson has brought a wealth of experience from her time in New Zealand to Niagara’s Peller Estates. She combines her love of agriculture, an affinity for science and a keen interest in sensory studies into her job that shows on her wines. She is also a self proclaimed ‘foodie’ where great food enhances her well-balanced wines. Try some of these wines on Mother’s Day, here’s wishing a Happy Day to all Mom’s out there!